Norway: Then and Now. 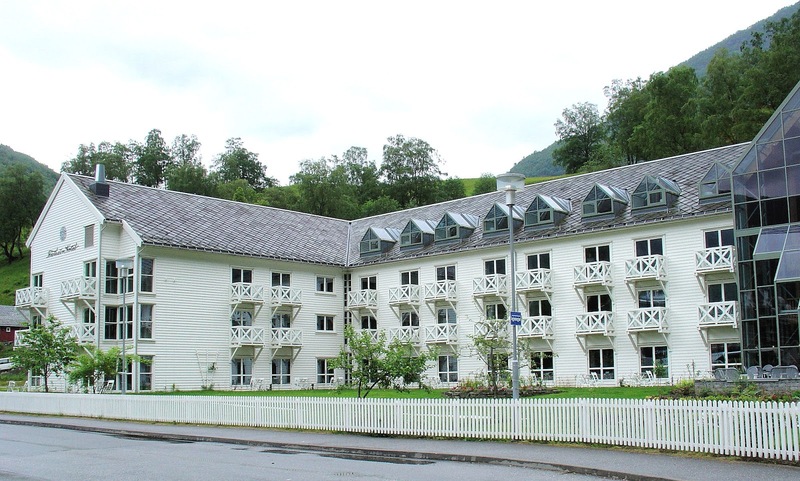 Here's a side-by-side comparison of the Kviknes Hotel in Balestrand. The photo on the left shows a modern-day view while the photo on the right shows the original building that was completed in 1894. In 1912, the 1894 building was extended westward to complete the inn as we see it today. Photography: Left - Courtesy of Kviknes Hotel. Right - Nelson Minar. Welcome to the September ArtSmart Roundtable. We're a company of travel bloggers—art aficionados who love to share our passion for discovering art while during our travels. Each month, we highlight one art subject and this month's topic is "Travel Art." With my recent voyage to Norway back in July, I remain awe-struck by the all the historic places we visited, some dating back to the 18th century, others to the dawn of time. While researching some of the articles I have published and yet to publish, I stumbled upon vintage travel photography of the places I had visited. To my surprise and delight, I was astonished to find that some of my current perspectives mirrored those in photographs snapped over a century ago! 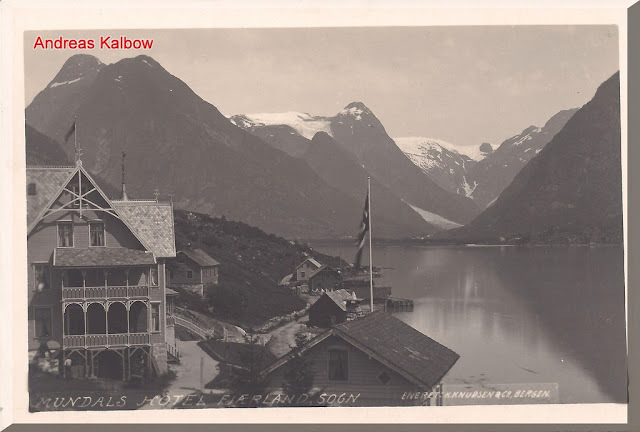 So, it with this theme of vintage travel photography that I dedicate this month's article to Norway: Then and Now—a look to the past and present of Norway's fjord country. At the end, be sure to review the rest of the Roundtable's contributions. Wherever I travel, my thoughts are always drawn to the history of the places I am in. What was life like when this land was first settled? How did it develop and prosper over time? When did the building first open and who were its patrons? When did the first travelers visit here? These are but a few of the questions that race through my mind which is why I decided to look back through time at some of the places I visited in Norway and highlight what is what like then and now. I hope you find it as fascinating as I do! What captivated my imagination most were the historic hotels we visited or call home for a night or two. While I plan to dedicate an article to each of these classic inns, I will briefly introduce them to you throughout the article. 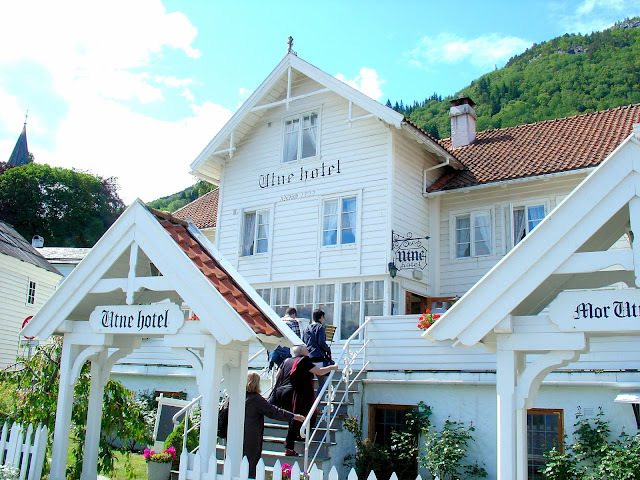 The Utne Hotel located in Utne, Norway along the Hardangerfjord. Photo: EuroTravelogue™. 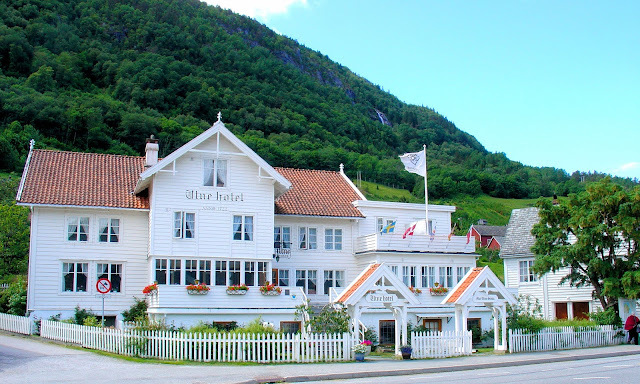 Located along the shores of the Hardangerfjord, the Utne Hotel in Utne, Norway is where we stopped for lunch en route to our final destination of the day, Balestrand. 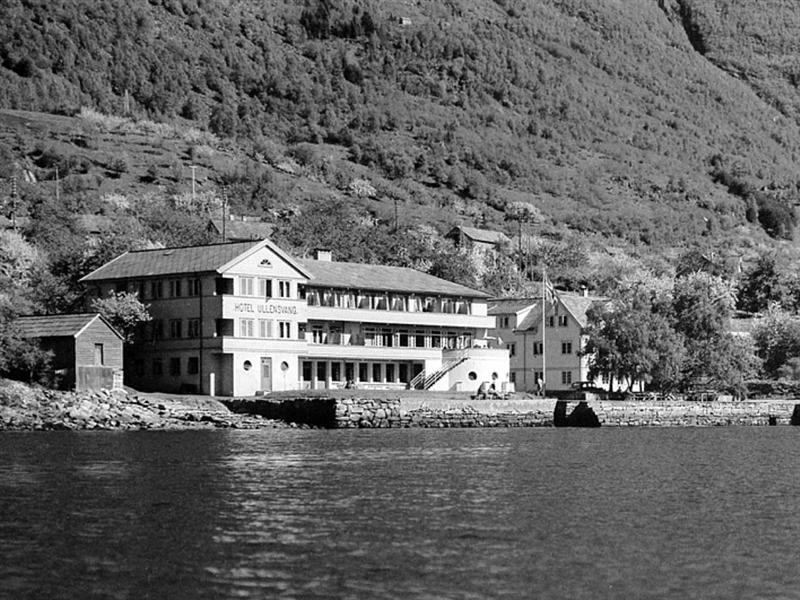 Holding the title of Norway's oldest hotel in continuous operation, the Utne opened its doors along the fjord in 1722 and as you'll see, it's been through many transformations since. What began as a guest house with just a living room, kitchen and one bedroom when Peder Larsson Børsem opened its doors to fjord explorers, the Utne Hotel has grown to 17 rooms, yet retained its historical charm over time. The most notable of all proprietors was none other than Torbjørg Johannes Dotter Utne aka Mother Utne who ran the hotel for 70 years and according to local lore, she still does. The Utne Hotel as seen at the turn of the 20th century. Photo: Courtesy of Historic Hotels Worldwide. The Utne Hotel as it appears today. Photo: EuroTravelogue™. 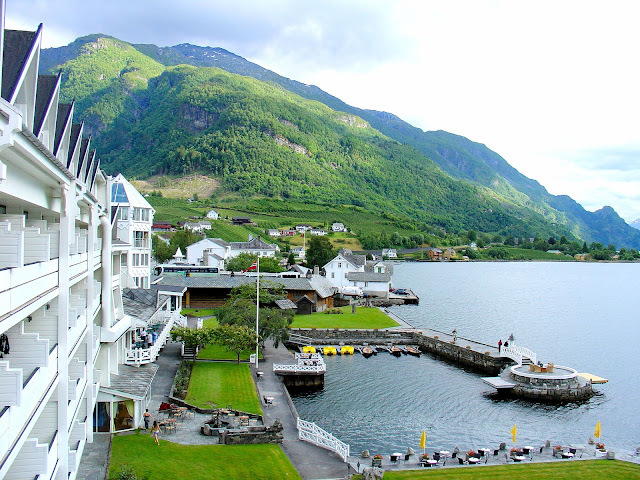 The magnificent exterior view of hotel is surrounded by sublime vistas of the Sørfjord and the mountains that cradle this branch of the Queen's Fjord aka Hardangerfjord. Photo: EuroTravelogue™. 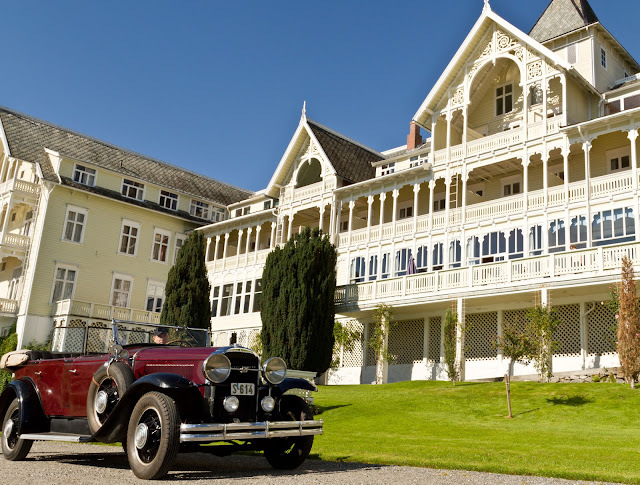 Run by the Family Utne for more than five generations, the Hotel Ullensvang in Lofthus is one of the grandest of the Norwegian inns. Located on the shores of the Sørfjord, a branch of the magnificent Hardangerfjord, the hotel's humble beginnings date back to 1846 when Hans Utne opened his one-bedroom "staging inn" in the loft above his steamship agency for patrons who sought room and board while traveling in the area. From there it grew to the 172-room inn that stands today and as you will see in the series of photographs, has undergone many transformations and modernization over the years. Step onto your veranda or stroll along the gardens along the water and you're surrounded by sweeping panoramas of stunning mountain vistas and the fjord! It's sublime! 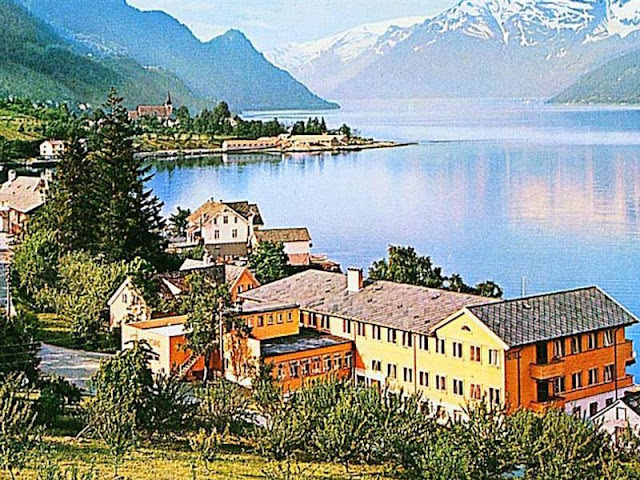 The very first Hotel Ullensvang was known as the "staging inn." 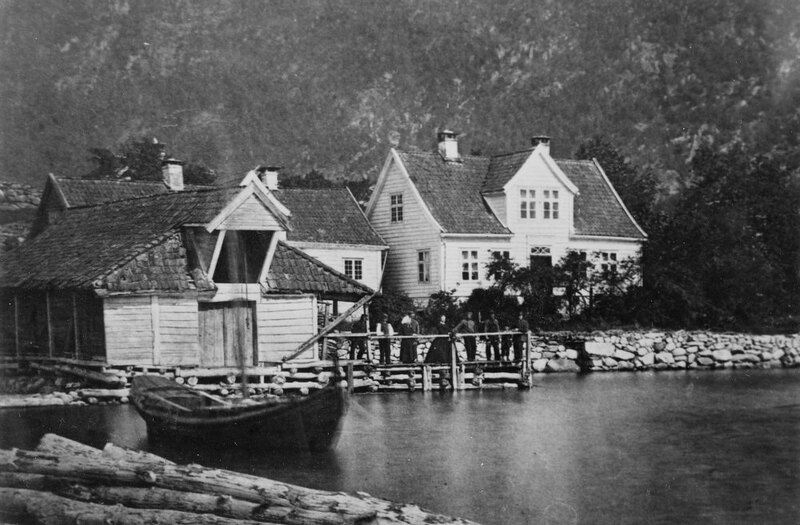 This photo dates to 1846 and shows the one-bedroom inn above the steamship agency. All historical photos in this series are the property of Hotel Ullensvang. Hotel Ullensvang as seen in 1875 in this historical travel photo showing the original steamship agency to the left and the guest house in the center. 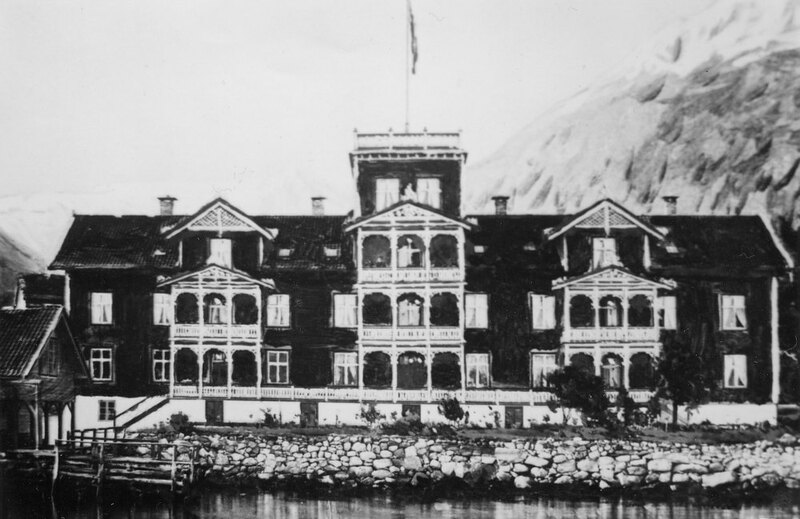 1890 brought about a much larger expansion effort transforming its shape into a grander fjord hotel. As seen in a Lofthus brochure from 1962. I don't think we even need to add a date to this brochure photo but if you're wondering, it's 1967. The magnificent Hotel Ullensvang as it is seen today against the backdrop of the Hardangervidda mountain range. Photo: EuroTravelogue™. The Flåm Railway as it's seen today. Photo: EuroTravelogue™. They called it a Norwegian masterpiece of engineering and it certainly was! When construction on the Flåm Railway began in 1923, workers had to overcome many challenges due to steep cliffs, hairpin turns and river gorges that ultimately led to the construction of 20 tunnels or almost 4 miles of tunneled railway; 18 of which were excavated by hand, with every meter of tunneled distance representing one month of hard labor. One fascinating fact is that railway crosses the river three times without ever once crossing over a bridge. How? Well, the engineers redirected the river through the mountain in tunnels below the railway. 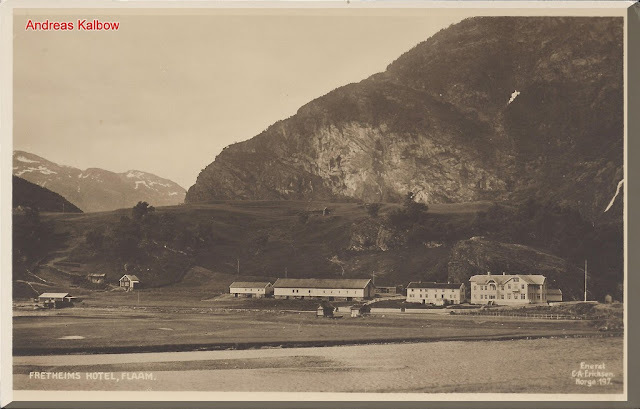 The first of the tracks were laid down in 1936 and the Flåm Railway opened to the public four years later with steam-engine service from Myrdal Station to the village of Flåm along the branch of the Sognefjord. In 1944, electric trains were introduced thanks to the Germans who constructed a power station at the nearby Kjosfossen waterfall. 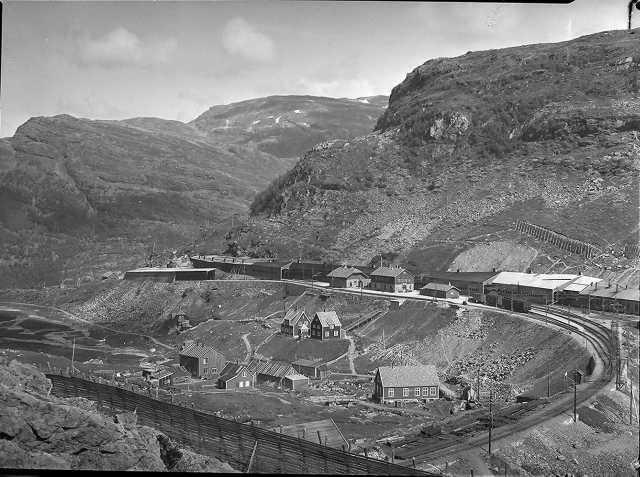 Myrdal station as seen in 1942. Photo: WikiMedia.org. 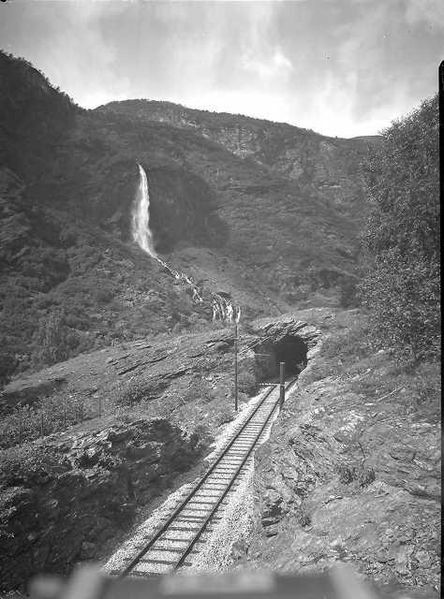 The Flåm Railway near Rjoandefossen as seen in 1942. Photo: WikiMedia.org. 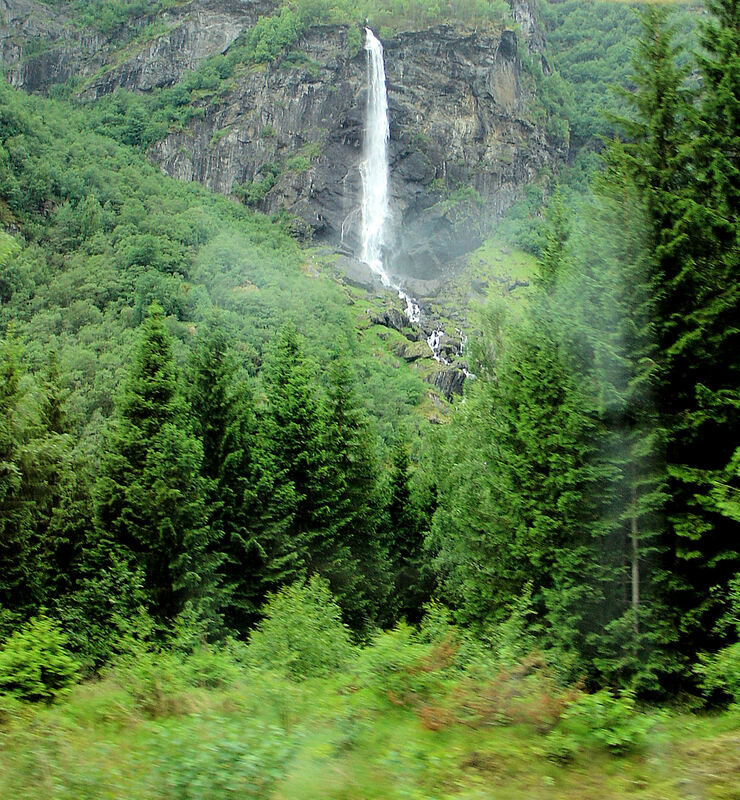 A similar view of the Rjoandefossen taken in 2013. Photo: EuroTravelogue™. The Fretheim Hotel in Flåm, Norway. This view shows the most current addition of the hotel that was added during the dining room expansion. Photo: EuroTravelogue™. 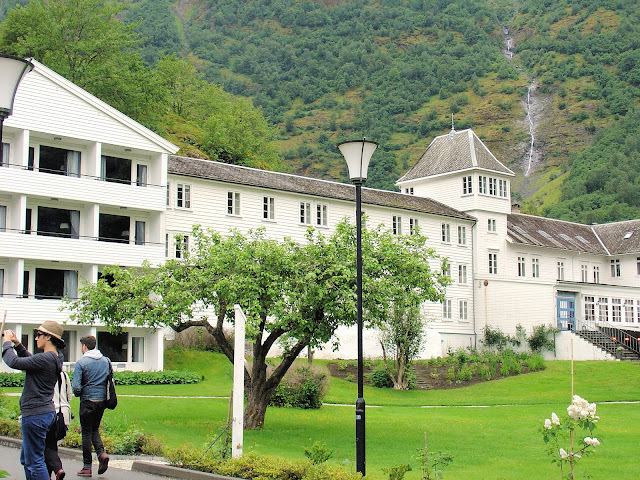 Nestled at the end of the Aurlandsfjord, a branch of the King of Fjords or Sognefjord, the storybook village of Flåm is a popular cruising port of call as well the end of the line for the renowned Flåm Railway, one of my unforgettable highlights of my recent tour through Norway. Steps away from the docks and railway station, you'll find the Fretheim Hotel where we were treated to lunch followed by a tour through the hotel's past and present. The English villa as seen in this 1910 photograph, was the first guesthouse to be opened by Christen Fretheim and it remains in operation today. Photo: Vogelfoto69. What began as a farm 150 years ago when English lords began hunting salmon and reindeer in Sognefjord region, the Christen Fretheim farm became their refuge for weeks and even months at a time. It was in 1879 when Christen decided to capitalize on his new opportunity and built guest houses for his English tourists. The first of these was and is still in use—the English Villa. It's from these modest beginnings that the Fretheim Hotel quickly grew to the 122-room inn we see today. Retrace these historic roots inside the hotel as you move along the corridor from the farm house to the English villa and tower and finally to the American wing. 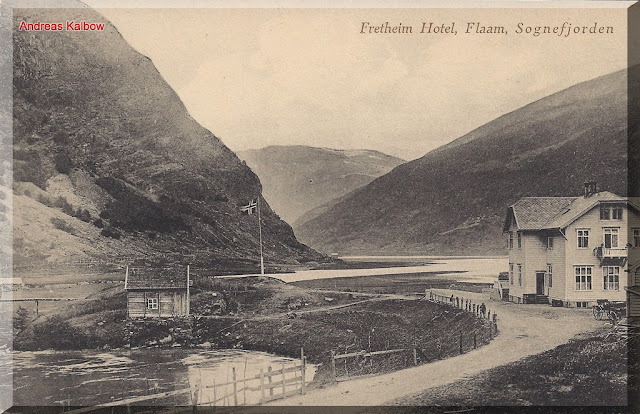 This view of Flåm and the Fretheim hotel appeared in an early brochure at the turn of the 20th century. Photo: Vogelfoto69. Modern-day view of the hotel shows the farm house and English villa to the right and as you walk to the left, you enter the American wing and eventually the dining wing where the main entrance and the new rooms are located. Photo: EuroTravelogue™. 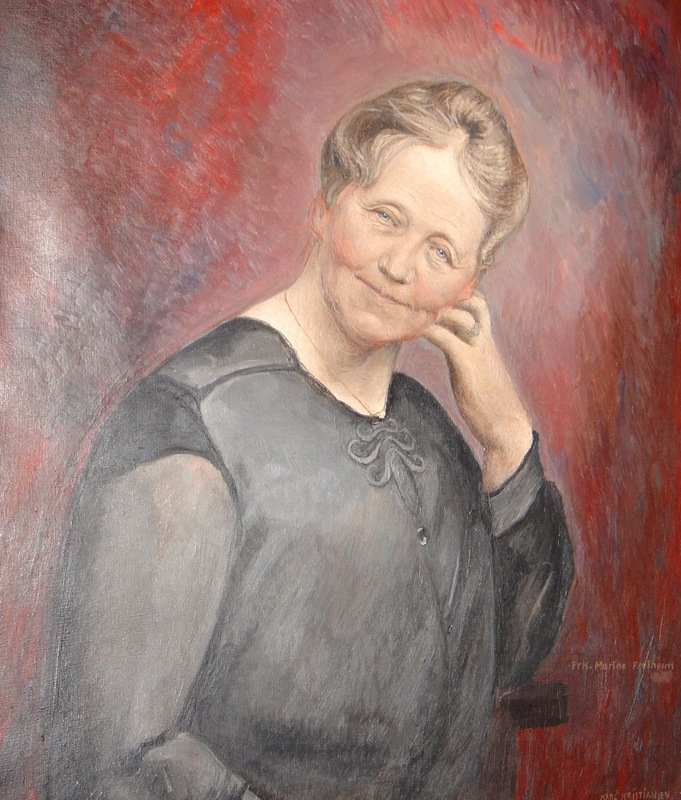 In 1909, Marthe Fretheim, a cousin of the farm's original owner, managed the hotel until her death in 1933. According to the hotel's current manager, Marthe still roams the halls of the hotel, objects to renovations and has a tendency to keep putting objects back in their or "her" rightful place. Although she is considered a kind and friendly spirit, there was a time during a recent renovation of her original quarters, that she actually struck one of the construction men on the shoulder. Needless to say, he never again returned to work. Portrait of Marthe Fretheim. According to the hotel manager, Marthe still roams the halls of the hotel tidying up and is said to evoke warmth and comfort whenever she enters the room. Photo: EuroTravelogue™. Welcome to the Kviknes Hotel in Balestrand, Norway. All photos in this section are property of the Kviknes Hotel. They call it the "Jewel of the Sognefjord" and when you see this charming hotel nestled on the shores of the Sognefjord, you will see why! 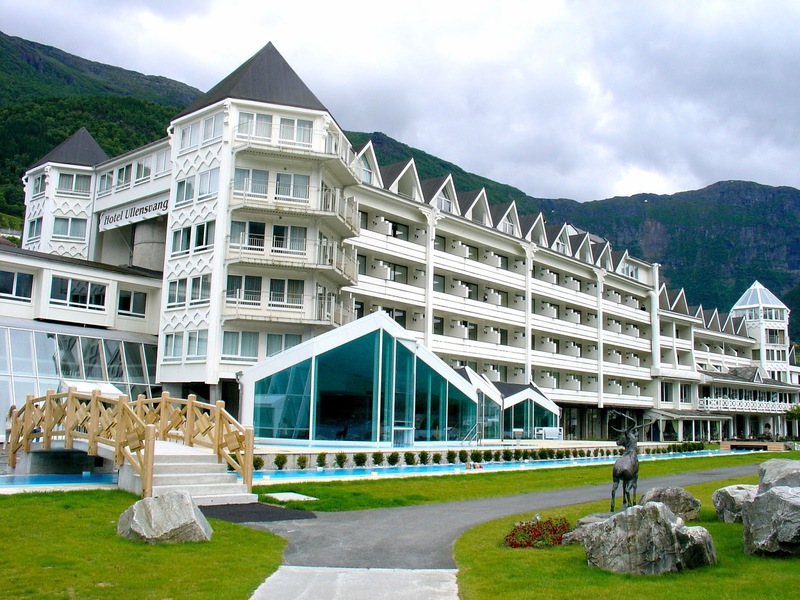 Located in the picturesque village of Balestrand, the Kviknes Hotel is one of stunning examples of the ornate "Swiss-style" architecture that prevailed throughout Norway in the 19th century. The building itself is a work of art in its ornamental latticework embellishing the verandas and windows ever so gracefully. 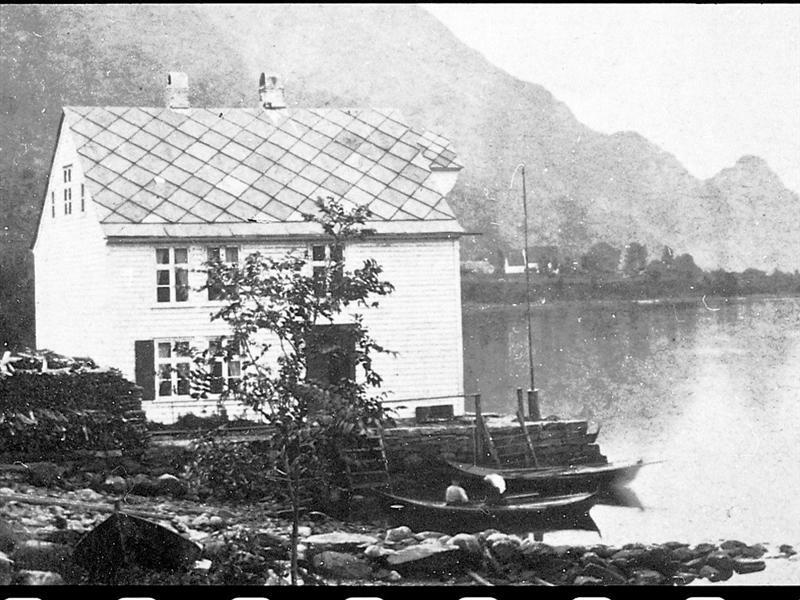 But the building we see today is the result of many transformations beginning way back in 1877 when Ole Kvikne purchased a local store and guest house in the hillside village of Balestrand in the Sogn region of Norway. 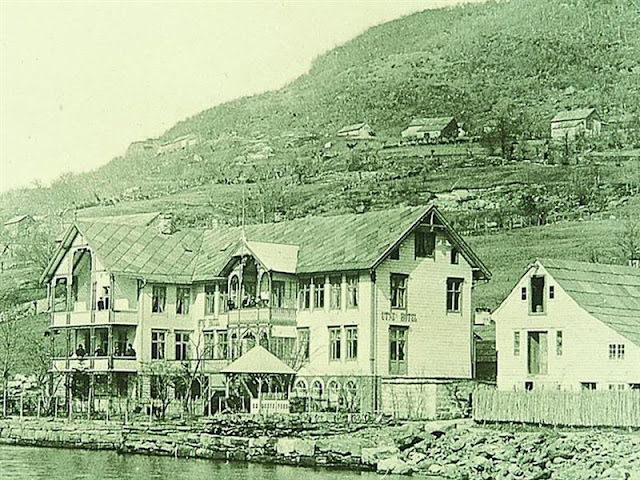 Due to the ever-increasing number of tourists, artists and royalty from around the world, the Kviknes Hotel transformed into the 190-room historic inn we see today. Thankfully, its predecessors were captured on film so we can retrace the hotel's evolution through a series of photographs below. 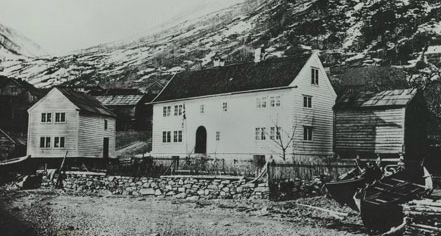 This photo taken in 1877 shows the guest house on the right with accommodations for four and the general store to the left. The original guest house and store were eventually razed to make room for the the new Kviknes Hotel in 1890 designed in the popular Swiss-style architecture found throughout Norway at the time. 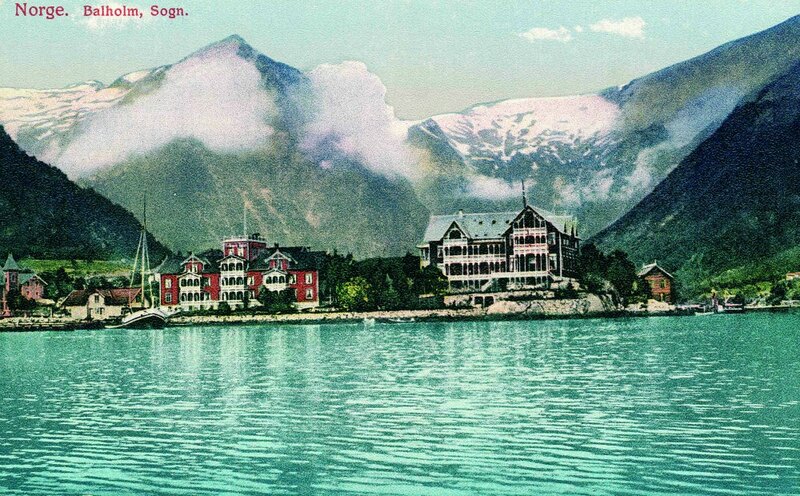 Norway postcard dated 1894 shows the 1890 Swiss-style building to the left and the newer 1894 building to the right which eventually was extended in 1912 to the building we see today. As tourism continued to grow in Balestrand and along the Sognefjord, a much larger hotel was needed so the 1890 building was razed to make room for the expansion of the 1894 hotel that eventually created the building we see in this image from 1913. 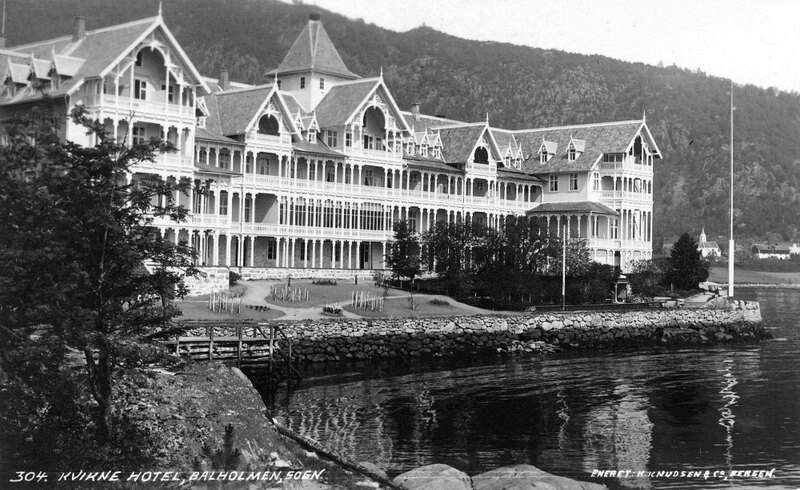 Fjærland the Hotel Mundal as seen in 1910. Photo: Vogelfoto69. 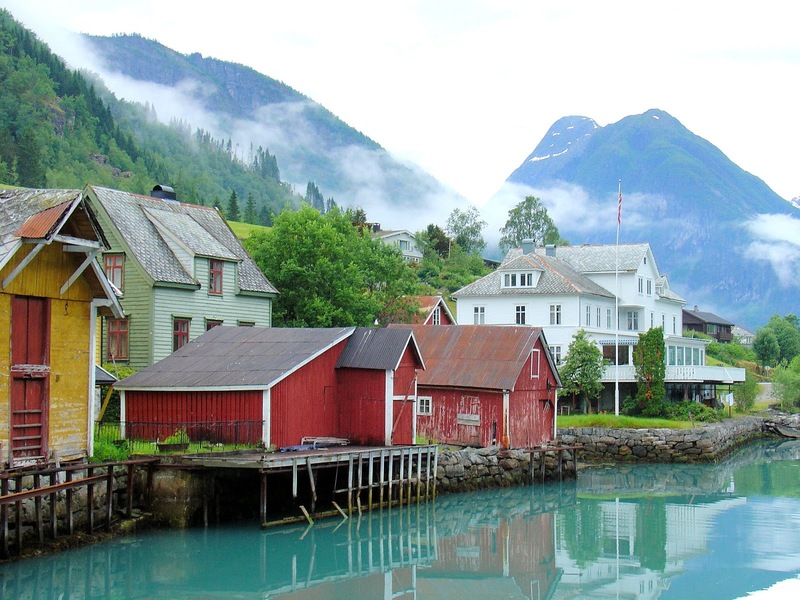 At the end of the Fjærlandfjord, one of the branches of the Sognefjord, is undoubtedly one of the most picturesque villages I have seen in Norway—Fjærland. Gateway to glacial hikes along the Jostedalsbreen Glacier and the Norwegian Glacier Museum, the village is also home to the 3-mile-long Norwegian Book Town, renowned for its collection of second-hand books; and the historic wooden-style Hotel Mundal built in 1891 and popular with tourists and hikers at the end of the 19th century. The hotel is still in operation today. 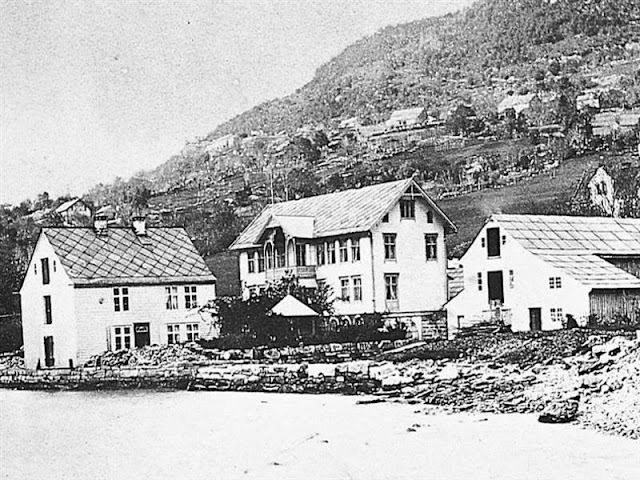 The view of Fjærland taken in 1910. Photo: Vogelfoto69. 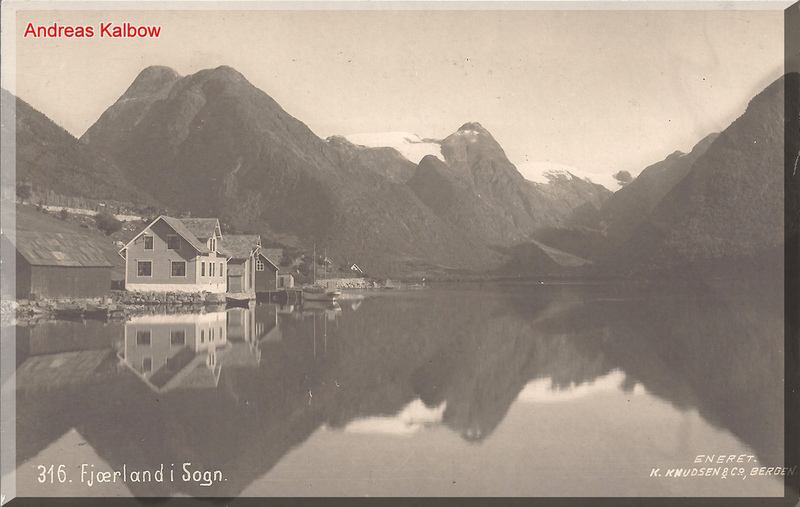 A similar view of the enchanting village of Fjærland shows not much has changed in 100 years. The white building in the background is the Fjærland Fjordstuer Hotel. Photo: EuroTravelogue™. Special thanks to Innovation Norway and Fjord Norway, both of whom made this trip possible! As always, my opinions and thoughts are mine and mine alone. Hi there Lisa!! Thank you so much for stoping by and for your kind compliments!! As you can probably imagine, Norway had a profound impact on my life and I am forever enchanted as well as fascinated by the grandeur of this country! I can't get enough! Glad it's inching up on your list! When it makes it to the top, do let me know! LOL! These are fabulous photos, Jeff. I like to think about the historical significance of places I go, too. Always interesting to see how much has changed and how much has stayed the same. Wonderful when they keep true to the original design or essence of the old places. Hey there Cathy and thank you so much for stopping by! I couldn't agree with you more! The history of all places fascinates me whenever I travel and thank goodness for preserving the traditions of the past! Great places to visit. As usual, you make such enticing photos of destinations that one is tempted to go there soon. So glad you liked the article! This was truly a labor of love but so glad it came together and that I had the resources available for the historical shots. Thank you for stopping by and sharing your thoughts!! I love your then and now photos. I do try to imagine life in the places I visit and if they're photos or historical accounts, I like to see how my imagination compares. I bet that Marthe was a force of nature when she was alive. She still has quite a hold on the hotel! Hi there Marcia and thx so much for stopping by! I am so happy to hear that you too think about the past in the present ... 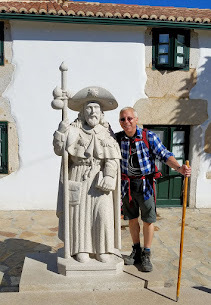 I have always been fascinated by the history of every place I have visited and those I have not! And you're right about Marthe! Incredible, Jeff! I just love these then-and-now photos. Imagine the Utne hotel opening its doors in 1722. It's in marvelous shape for nearly 300 years old! 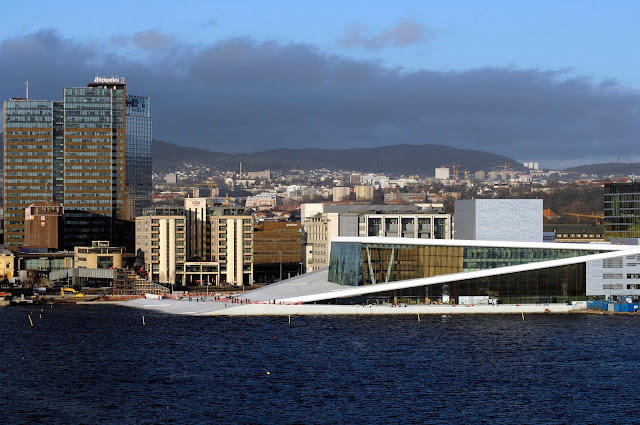 Norway seems to do a great job when it comes to preserving its heritage. Hi Lesley!! Isn't it thrilling to know that Norway cares so much for its past as much as it does for its present??!! I had so much fun putting this together albeit quite the workload! Even the matriarch of the Kviknes Hotel loved it ... which thrilled me because she's a wise woman and protects her property very carefully! Thank you so much for stopping by!! Excellent presentation of history and the present day, Jeff. I always enjoy seeing then and now pictures and I loved all of this. These hotels and scenery are just gorgeous. 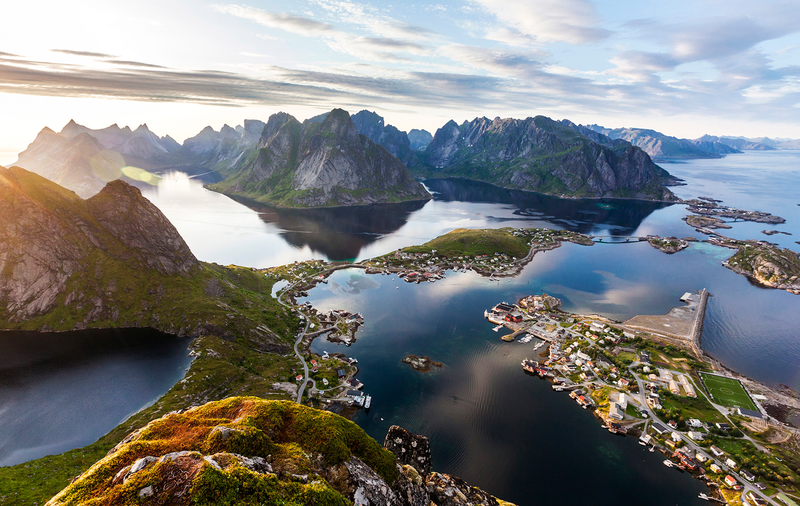 I haven't been to Norway yet but that last picture is enough to make me keep dreaming of going there. Thanks for all this useful information when I finally get there. Hi there Mary! Thank you so much for your kind words! I really appreciate that! I had such a good time putting this together and researching the historical photos, thankfully the hotels were very helpful! That last pic is of Fjærland, a sublime little village at the end of the fjord. I was blown away by it's beauty! Thank you for stopping by and sharing your comments. Really cool post Jeff! I love looking back to see how things have changed or perhaps stayed the same. I'll have to make it to Norway someday. My great great grandparents emigrated to Canada from there and I think it would be interesting to check into the genealogy and perhaps see some things they might have before leaving the homeland. I'm also drawn to old photos of houses, hotels, squares... and am always happy when they look much the same today as they did 100 years ago. So fascinating to look at a photo of wherever I'm standing right now, and seeing people dressed in early 20th century-fashion standing in the same spot. It's as if we're all there at the same time. Love Fjærland, and Mundal is one of my favourite hotels, love staying in the turret room. Hi there Sophie! Thx so much for stopping by and sharing your experiences of time travel! Isn't is fascinating??!! We didn't have the opportunity to visits the Hotel Mundal but next time for sure and the Turret room it will be! Valletta: Europe’s Most Underrated Capital? Is there an age limit on cycling holidays?